Household electricity prices in Australia have risen by more than 40 per cent since 2007, and are projected to rise by another 30 per cent by 2013–14. The next federal election must be held by November 30, 2013, and just as electricity prices played a major role in the recent Queensland state election campaign, we can be certain that the same thing will happen during the next federal election campaign. If we have a very hot 2012–13 summer, then the possibility of blackouts is a real one and that would add grist to the mill. In March 2009, Quadrant published our article “The Very High Price of PC Power”, which described the forces which were changing Australia from a nation which had enjoyed one of the lowest electricity cost regimes in the developed world, to one where electricity prices would become amongst the highest. All of our predictions have been fulfilled. The low-cost electricity we once enjoyed was obviously of great advantage to ordinary families, whose standard of living was thereby enhanced. But it was of greater importance to commercial and industrial consumers, who were able to offer goods and services at lower prices, and to employ more people. Cheap electricity is a major contributor to national prosperity and to economic diversity, and the increases in prices that have taken place, with more in the pipeline, will spread through the economy with continuing deleterious consequences. We will see the closure of industries which have relied on cheap electricity for their international competitiveness. Industries such as retailing, already under pressure from changes in consumer behaviour, will find these increases burdensome. Electricity prices have now become a major political issue, but because both sides of politics have been guilty of serious misdemeanours in driving these increases, both sides of politics will try to fudge the problem, and will seek to lay the blame on others. Further, because both Labor and Liberal leaders have either embraced or failed to challenge the global warming fantasy which has now resulted in Australia adopting a carbon tax regime of unique proportions (albeit temporarily), there are many commentators, economists and electricity industry leaders who have climbed on board the “carbon is a pollutant” gravy train, and cannot see a way of climbing off with dignity. This has resulted in attempts to explain these cost increases without any mention of the imposition, by government fiat, of consumption of electricity obtained from “renewable energy”, and the highly privileged position given to the owners of these “renewable energy” sources. The mechanism through which electricity consumers pay greenmail to the owners of windmills and solar panels is the mandatory Renewable Energy Certificate, introduced by John Howard in his 2001 MRET legislation. As James Delingpole explained in the Australian on May 3, writing about the ghost town of Waterloo in South Australia (now depopulated by the impacts of the sub-audio frequency vibrations generated by the nearby wind farm), a 3-megawatt wind turbine, costing $6 million, will be lucky to generate electricity worth $150,000 in a year, but will receive $500,000 in RECs, paid for by the hapless electricity consumer. As a consequence of the hostility to rising electricity prices that emerged during the Queensland election campaign, the new Premier, Campbell Newman, like King Canute, declared he would ban any further increases in electricity prices. This problem, however, requires much more purposeful activity by governments than forlorn attempts at price controls. It is now time for the Coalition to prepare itself for an election campaign in which it can put to the electorate a serious program of reform for the electricity supply industry—one which will require the co-operation of the states, but will also require a mea culpa from the Coalition which, under John Howard, introduced this appalling imposition of “renewable energy” on Australian families and businesses, and to which the Coalition still pays lip service. Our story begins when the Industry Commission brought down its report on the electricity industry in May 1991. Previously this industry had comprised a set of state government monopolies which, despite the low-cost fuel that powered the generators, were becoming increasingly uncompetitive, owing to the takeover of the industry by the unions. State governments became concerned at the capacity of unions to shut down power stations and hold the community to ransom, and there was a general awareness that there was a great deal of waste and inefficiency in the industry4. Following the Industry Commission report the eastern states came together to establish the National Electricity Market (NEM) along with NEMMCO (National Electricity Market Managing Co). (Western Australia and the Northern Territory were too far away to be included.) The NEM extended from Port Douglas in Queensland to Port Lincoln in South Australia, and Tasmania joined when the Bass Link cable was commissioned in April 2006. The NEM enables an import-export trade in electricity between the states which has maintained downward pressure on prices. Competition between generators and retailers was introduced in most states. Only the high-voltage grid and the low-voltage distribution networks were kept as regulated, state-owned monopolies. Interstate trade enabled Victoria, with its brown-coal-based generation in the Latrobe Valley, and as the lowest cost producer, to export more5. New South Wales, which has limited peaking capacity, is a net importer. Queensland is a net exporter, particularly of peaking power, and South Australia, a state in which a number of superannuation funds have spent over $3 billion on worthless wind farms, is an exporter when the wind blows and an importer when it doesn’t. 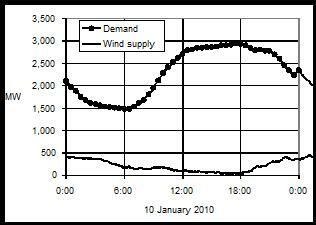 The problem with the wind is that it hardly ever blows at times of maximum demand—the air-conditioning peaks of January and February—and so South Australia has to pay top prices for peak power in the late afternoon and gets bottom prices or even negative prices for power generated in the wee small hours of the morning. These curves for South Australia for Sunday January 10, 2010, demonstrate two things. First, maximum demand of nearly 3000 MW plateaued between 1 p.m. and 7 p.m. but that the output from wind farms, nearly 500 MW during the very early morning when demand was a minimum and the price was $25 per MWh, dropped back to virtually zero between 3 p.m. and 6 p.m. when demand was high. The cost curve shows that between 6.30 and 7.30 p.m. a price hike going from $150 to $2000 per MWh imposed huge penalties on South Australian consumers. Nothing demonstrates more powerfully the idiocy which has driven at least $3 billion of “investment” in wind power. This price spike can be blamed on the absence of wind power just when it was most needed. Although the establishment of the NEM and NEMMCO was a great step forward for the industry, there was a risk of political interference from Canberra, and that risk was realised when John Howard was able to use NEM and NEMMCO as part of his plan for seizing control of the industry under the guise of “renewable energy”. The first Howard government was elected, in a landslide, in March 1996. In 1997 Howard announced the imposition, on the electricity supply industry, of an additional 2 per cent “renewable or specified waste energy” target for 2010. On the basis of the consumption that year of some 250,000 GWh, this would have been 5000 GWh, but the MRET target was reinterpreted and almost doubled to 9000 GWh. As Opposition Leader, Turnbull supported, on August 19, 2009, the Rudd government’s amendment to the MRET legislation which mandated a 20 per cent renewable target for 2020, a decision which further alienated Liberal Party backbenchers who were concerned at the bipartisanship which Turnbull was promoting for support for the Rudd government’s Carbon Pollution Reduction Scheme bill. This was the consequence, then, of Howard’s commitment back in 1997. His centralism,9 combined with minimal understanding of how the electricity industry worked, imposed a huge burden on ordinary Australian families. Given the absence of any serious political opposition to Howard’s policy, the electricity supply industry, which had always been subject to political control by state governments, collaborated in policies which they knew would generate large price increases. The Howard government relied on the foreign affairs power to take over the industry. The corporations power cannot be applied to corporations owned by state governments, and although Howard refused to ratify the Kyoto Protocol, Australia under Keating had ratified the UN Framework Convention on Climate Change, and it was believed (but never tested) that this was enough to give Howard the constitutional authority to take over the industry10. The companies comprising the industry, whether government or non-government, did not face significant competition from other energy sources11; they knew that the prospect of new entrants into the industry (other than wind-farm speculators with good political connections), under the conditions of the huge sovereign risk which now applied to the industry, was zero; and they were secure in the knowledge that the regulators would always allow them to pass on the inevitable price increases. So, provided their participation was profitable, they were happy to participate in the nonsense being foisted by completely ignorant politicians on a rationally ignorant public. In 2000 the Howard government’s MRET legislation, which required the sourcing of an additional 2 per cent of electricity (or 9,500 GWh) annually from renewable energy sources by 2010, was passed.5 It comprised the Renewable Energy (Electricity) Act 2000 (REE Act), which obliged Australian electricity retailers to source increasing amounts of their required electricity from approved renewable sources. Other legislation underpinning this scheme was the Renewable Energy (Electricity) Charge Act 2000, and the Renewable Energy (Electricity) Regulations 2001. This unprecedented interference by a federal government in the day-by-day activities of a major industry was administered by the independent Renewable Energy Regulator. But now the renewable energy chickens are coming back home, roosting in their nests and fouling them at the same time. Those in the electricity supply industry who can read the wind realise that their management of the industry will come under close scrutiny as new governments come to office and respond to the political forces that helped to get them there. As far as the electorate is concerned, what has happened to electricity prices is something for which governments are responsible and something the new governments they vote into office will have to fix. If they fail in this task, their hold on office will be tenuous. This will apply to both federal and state governments. In order to retain political credibility, and push electricity prices back to internationally competitive levels, the forces which have pushed up electricity prices have to be accurately identified by the incoming federal government, and then with state government co-operation, cut back ruthlessly. The Commonwealth’s responsibility has been both direct—as in Howard’s MRET legislation of 2000 and Rudd’s legislation of 2010—and just as significantly indirect, as the continuing attack on coal, both under Howard12 and more recently under Rudd and Gillard, has made investment in new coal-fired power stations far too hazardous for private investors to contemplate. The MRET scheme, on its own, has led to so-called investments, mostly in South Australia but also in New South Wales, of at least $3 billion in wind farms. These wind farms are economically worthless13, in that their output is unpredictable and cannot be sold without government coercion. So the NEMMCO system operators who allocate output, on the basis of competitive bidding, to the generators for the next day, have to arrange for at least 90 per cent back-up for whatever wind-farm output is proposed by the owners. Because of the MRET legislation this output gazumps all other generators, as the coal and gas-fired generators have to purchase the RECs required by the Act. But apart from the Commonwealth legislation for mandatory renewables, it has been the bi-partisan attack on coal (alias carbon) which has been the main problem. In the current political climate, where both sides of politics have set themselves decarbonisation targets to fulfil, the failure to invest in new coal-fired power stations is at the heart of our current electricity problems. No new coal-fired power station has been built within the NEM network since 1992, and in order to maintain security of supply, generating companies have been buying low-capital-cost, high-running-cost, gas turbines (jet engines used for 747s), coupling them to relatively small generators and using them to supply intermediate and even base-load demand. The lack of low-cost coal-fired electricity has been an important contributing factor to the cost increases of the past decade. The entire “renewable energy” fantasy is based on the doctrine that anthropogenic emissions of carbon dioxide, particularly the carbon dioxide which comes out of the exhaust gas chimneys at coal-fired power stations, will increase global temperatures14. The de luxe version of this scam is that we are close to a “tipping point” at which the next tonne of emitted carbon dioxide will trigger runaway and irreversible global warming, leading to the rapid onset of climate catastrophe and the end of civilisation as we know it15. So every time a political leader, whether past or present, or a current super-fund manager, uses the term “renewable energy” in pleading a case, he or she is relying on the shared, never-challenged, but unspoken fantasy of a climate control room in Canberra where, by turning up or down the Australian anthropogenic carbon dioxide tap, the Australian Climate Controller General16 can reduce or increase global temperatures according to his or her fancy. In renewable energy, we don’t really need further government facilitation; we need enforcement of the law in renewable energy and we need the retailers [electricity retailers] not to play games and to start actually providing contracts for the output of new wind farms. Essentially that’s what it’s about, rather than hanging out for perhaps some change in policy which will allow them to continue with their coal-fired assets or to build gas assets. Garry Weaven is a former trade union official, who became Assistant Secretary of the ACTU and then rode the wave of compulsory superannuation to become a heavyweight in the financial services sector. As this quote from the ABC interview makes clear, he hasn’t changed his demeanour since his days as a trade union enforcer, nor softened the stridency of his language towards those whom he sees as obstacles to his ambitions. It is said that the union super funds have $3 billion invested in Pacific Hydro, almost 10 per cent of their entire portfolio. Pacific Hydro would collapse if the MRET scheme was repealed. In a democracy, regular elections enable the nation to throw out governments that fail to solve major problems (mostly created by previous governments) and install new governments to undo much of the mischief for which previous governments have been responsible. But mischief is often bipartisan, and “renewable energy” is a prime example of bipartisan folly. So the leading figures of the electricity supply industry are now preparing the narratives which they hope will get them out of trouble after twenty years of collaboration with the dark green alliance which has done so much to drive up electricity costs. This alliance included John Howard, the now forgotten Democrats, the green wing of the ALP, the Greens (who supplanted the Democrats), and the environmentalist movement generally, all aided and abetted by the CSIRO and the Bureau of Meteorology. Around half of the MFP decline in ES was due to an increase in the ratio of peak to average electricity demand, which lowered average rates of capacity utilisation. This was largely attributable to rapid growth in household use of air-conditioners. Three other contributors were: cyclical investment in lumpy capital assets, which temporarily increased inputs ahead of growth in output; a shift to greater undergrounding of electricity cabling, which raised costs and the quality of output, but not the volume of measured output; and policy induced shifts away from coal-fired power to higher-cost, but less polluting, sources of new supply. There are key verbal indicators which tell us that either the authors are pulling our legs, or just don’t understand what they are saying. The phrase “policy induced shifts away from coal-fired power to higher-cost, but less polluting, sources of new supply” is such a phrase. The belief that coal-fired power stations are polluting is based on the faith which many chattering-class people have in the power of atmospheric carbon dioxide to raise global temperatures, and of the importance of the contribution which anthropogenic emissions make to increasing the atmospheric concentrations of carbon dioxide. These are doctrines that are held, often passionately held, despite the overwhelming empirical evidence which tells us that neither belief has any substance. The higher-cost, but “less polluting sources” of new electricity supply are wind turbines and solar panels18. Wind turbines suffer from the unpredictability of their output, both as to power output and the time of day when they will be generating power. As participants in an electrical supply system which spans five states, they are worthless. The money spent on them and on the transmission lines connecting them to the main grid is an example of pure waste. The electricity industry must carry a major portion of the blame for this state of affairs. When John Howard first proposed his 2 per cent target, he should have been met with a barrage of criticism from the electricity supply industry. But there was none. Solar panels are much worse than wind-farms. They are at least four to five times as costly as coal-fired power. They only operate when the sun shines. They are a mechanism for transferring large sums of money from poor families to rich families, who not only receive hugely inflated sums for electricity they feed into the grid, but who advertise their green piety with large solar installations on their roofs. These solar installations are rarely seen on modest homes; they are the green equivalent of the Mercedes in the driveway. The interim report from the Productivity Commission emphasises the impact of the spread of domestic air-conditioning as a key factor in forcing up electricity prices. Although domestic air-conditioning is turned on for part of the day, every day, during the wet season in tropical Australia, south of the Brisbane line it is turned on only on hot or humid days, which may be only ten to thirty days during the southern summer. Here we can find evidence that domestic air-conditioning has played a role in increasing demand. 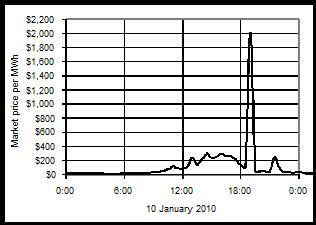 Between Saturday January 18, 2003, and Saturday January 24, 2009, the MD went up from 10,000 MW to over 12,000 MW. What is also relevant is the duration of these loads, between four and six hours. These are not half-hour peaks. 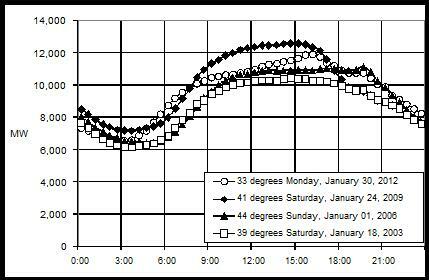 Load curves in Victoria for highest temperature days in Melbourne for January. 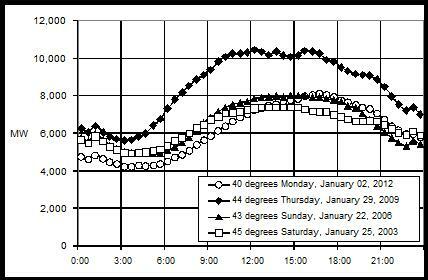 In Melbourne the highest demand occurred on Thursday January 29, 2009, when it was 44 degrees. The maximum demand was 10,200 MW between noon and 4 p.m. This was a working day, whereas the other three curves were for weekend or holidays. There has been virtually no increase between 2006 and 2012 for the time of the day when domestic air-conditioning would have impacted most severely on the system. Arguably the electricity industry’s most influential apologist is Keith Orchison. His career as a lobbyist for the industry is widely recognised19, and he is now spearheading their campaign to obtain absolution for past sins. The plea for forgiveness is encapsulated in the following exchange between Telegraph columnist Miranda Devine and Orchison. Good luck with that, considering greenies are the chief cause of grief to the bush. Wind turbines plonked all over bucolic hillsides. Sky-rocketing energy prices, thanks to the Greens-mandated carbon tax and clean energy follies. This statement upset Orchison, who responded a day later, saying, “as a country we have decided we would like to take action to reduce the growth of greenhouse gas emissions domestically”. If, as Orchison has argued, and the Productivity Commission’s Staff Working Paper21 has accepted, at least up to a point, electricity price increases have been caused by the costs of maintenance catch-up, and the new investment in transmission capacity required to handle the increased peak demands caused by the surge in installation of domestic air-conditioning, then bipartisan decarbonisation policies would be irrelevant to his story. There can be no argument that the boom in domestic air-conditioning since the early 1980s, when only 30 per cent of Australian homes had air-conditioning, to 2008 when the figure was 70 per cent, has changed the structure of the electricity supply industry. But this change is no different in scope from the changes caused by the earlier introductions of washing machines, clothes dryers, dishwashers, fridge-freezers and so on. Once air-conditioning became affordable for the average Australian family it was not difficult to work out that, just as washing machines, clothes dryers and refrigerators before them had transformed domestic life in Australia, with a corresponding increase in per capita consumption of electricity, the electricity industry would have to increase its generating and transmission capacities to meet the increased demand in air-conditioning. Building a power station with a life expectancy of thirty to forty years22 and a high voltage transmission line with a life expectancy of forty years are investments in capital works with a long life ahead of them. There is no risk in such investments. The demand for electricity continues to grow and as Australia’s population increases, and living standards rise, borrowing the money to build these installations and amortising the debt over twenty-five years or so is hardly imprudent economics. But when these distribution networks are owned by state governments, then the idea of borrowing for capital expenditures is abhorrent. Protecting a state’s triple A rating (or as in the case of Queensland, recovering it) is the most important item on a state treasurer’s agenda. However, that is an argument for privatising these assets and getting private owners to find the capital for these expenditures. There is no difference between privately owned power transmission lines and distribution networks and privately owned toll roads. Everyone involved in the electricity industry knows that decarbonisation has been central to the surge in electricity prices, and the attempts by industry spokesmen and their collaborators in the media and in politics to pretend otherwise, are special pleading of a particularly objectionable kind. If successful, such pleading would send incoming governments and their advisers, committed to reform, up garden paths away from the stinking fish23 of renewable energy24. The rationale for “renewable energy” was that by phasing out coal and converting to politically-correct electricity generated by wind and solar, Australia’s “carbon footprint” would be reduced, contributing to a diminution of anthropogenically induced global warming. Suddenly, carbon dioxide became “polluting”25, Hazelwood power station in Victoria’s Latrobe Valley became the nation’s “worst polluter”, and no government, and certainly not the owners of the Latrobe Valley power stations, made any attempt to rebut this nonsense which the green collective at the Age, particularly, never tired of promoting. The most interesting aspect of the electricity industry’s pleas for forgiveness is that they have taken Basil Fawlty’s advice to heart. Basil Fawlty gave to the English language the phrase “Don’t mention the war”, and the apologists for the electricity supply industry have adapted his advice to read, “Don’t mention the windmills”. If the drivers of rising prices are maintenance catch-up, and falling load factors in the daily load curve, then wind-farms, solar panels, and other decarbonising policies are innocent, but Orchison claims: “as a country we have decided we would like to take action to reduce the growth of greenhouse gas emissions domestically”. Two points have to be made. First, as the 2010 federal election, and the 2012 Queensland election made clear, we have not decided as a nation to reduce the growth of greenhouse gases, unless such reductions are cost-free. In 2010 only the Greens went to the electorate with a carbon tax policy. Both Julia Gillard and Tony Abbott were emphatic in their opposition to such a policy. In the Queensland election campaign, Campbell Newman campaigned vigorously against the Gillard carbon tax and Labor suffered huge losses. National polling during May 2012 showed growing public dismay at the onset of the carbon tax, and political observers were commenting on growing apprehension in Labor parliamentary ranks about the consequences of this dismay. Any political observer with some appreciation of how the tide of opinion works its way through our political institutions is aware that Gillard’s carbon tax will be repealed after the next election. As a consequence of the overwhelming LNP victory in Queensland, decarbonising regulations and legislation will be rolled back, first in Queensland and then in other states and federally. Shadow Minister Greg Hunt’s promises of federally based regulatory decarbonisation will be abandoned, preferably before rather than after the election. The retrenchment of 300 public servants from the Federal Department of Climate Change in April is merely the precursor to the retrenchment of the 600 who remain and the abolition of the department in its entirety. There is now 1880 MW of nameplate capacity on the wind farms that have been built in south-eastern Australia, most of them in South Australia. A commonly used figure for installation costs is $2000 per kW or $2 million per MW, giving an expenditure of $3.8 billion. This does not include the cost of connecting these wind farms to the main power grid, a cost which has been buried under the label “network costs”, $22.4 billion being spent in total between 2005 and 2014 in New South Wales alone. It is argued that much of this expenditure is necessary because of the rise in peak demand, caused mostly by domestic air-conditioning. The Productivity Commission’s Working Paper mentions the shift from overhead distribution to underground cables as contributing to the cost increases that have been imposed. There is no doubt that underground cables are several times as expensive as overhead lines. In the boom that has taken place in high-rise apartment building in the Melbourne and Sydney CBDs there is no alternative to using cables to supply these apartments with electricity. There is also no escape from the need for air-conditioning for these places. But the cost of these cables should have fallen on the developers of these projects, and the use of demand meters as well as the conventional electrical energy meters26 in each apartment would have led to careful use of electricity by the flat-dwellers. So the arguments about network costs have to be dissected. How much has it cost to connect the ever-spreading wind farms to the grid? What proportion of undergrounding the distribution network has been paid for by developers? To what extent have new electricity supply regulations imposed unnecessary costs on home buyers in the outer suburbs? To what extent has capital expenditure been paid out of recurrent revenue? We can expect the Productivity Commission’s investigation to clarify these matters. Blaming air-conditioning for price increases offers a neat fit with ignoring the costs of renewable energy. The Greens and their fellow travellers from the chattering class hate air-conditioning. In February 2008, the Headmaster of Trinity Grammar, one of Melbourne’s most successful private secondary schools, announced he was turning off the school’s air-conditioning, telling staff and students they had to be more resilient and show their concern about global warming. A year later, when the Rudd government was injecting money into the economy to ward off the GFC, they built lots of school libraries and other school facilities, but expenditure on installing air-conditioning was specifically prohibited. As a result, school halls were to be repainted, libraries were to be built, but students and staff would continue to swelter on hot and humid days. I don’t think so; there is no need for them to be banned at this stage. But I think for the benefit of people’s hip pocket and for the benefit of the environment, you can use air-conditioners more sensibly. Victorians now use more electricity in summer than winter because of air-conditioners. 1. The mandatory use of so-called renewable energy—from wind turbines and solar panels. 2. The absence of any new investment in base-load coal-fired power stations since 1992, and the replacement of cheap base-load power with high-cost output from gas turbines. 3. The attempt to persuade consumers to change their consumption patterns through the use of so-called smart meters—an attempt which has turned out to be counter-productive in Victoria but which has cost hundreds of millions of dollars to date. Presumably the idea is that using smart meters will persuade households to turn on their washing machines in the early morning hours, and turn off their refrigerators during the peak hours of the late afternoon. This would avoid, so the Greens tell us, the need to build new generating capacity. 4. The use of recurrent revenue to pay for capital investments in transmission and distribution systems. It is impossible for an outsider to determine the magnitude of these costs with any degree of confidence. The Commonwealth Department of Climate Change used to publish estimates of the costs of renewable energy. It no longer does so. Given that this issue will be an important issue in the next federal election, the Coalition needs to get on top of it so that it can claim, with confidence, that the measures it will undertake in government will push electricity prices down. So the appointment of a credible working party, charged with finding out what has really been driving these price increases, and how they can be reduced, is now important. A telephone call to former New South Wales Labor Treasurer Michael Costa, asking him to take on the leadership of such a group, would be timely. Ray Evans worked as a young engineer in the 1960s in the Production Planning Section of the State Electricity Commission of Victoria. Tom Quirk was deputy chairman of the Victorian Energy Networks Corporation. 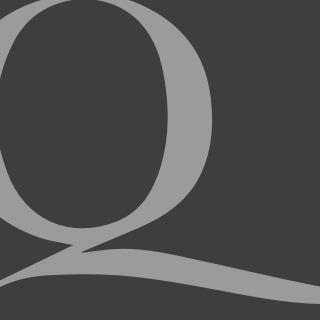 A footnoted version of this article appears on Quadrant Online. 4 (Footnotes 1 to 3 have been deleted.) When Ray Evans was a young engineer working in the SECV in the mid 1960s, the SEC was known as “safe, easy and comfortable” and the most important thing was to find something to do and then to jealously guard your ownership of it. 7 Unless a new, major hydro-power station such as Tasmania’s Gordon below Franklin scheme is built, the target of 20 percent renewables by 2020 will be impossible to meet. 8 We are indebted to Alan Moran of the IPA for much of this detail. 9 John Howard was an unapologetic centralist and did everything he could, during his prime ministership, to undermine the sovereignty and independence of the States. There were very few federalists in his cabinets and they were on a hiding to nothing if they fought against the PM on these issues. 10 On the grounds that the UNFCCC committed the parties to unspecified attempts to reduce anthropogenic emissions of carbon dioxide. 11 Gas competes with electricity for domestic cooking and heating. 12 John Howard established the Australian Greenhouse Office and funded it annually out of the budget with $100s of millions. This money was spent in buying up economic consultancies, universities, and giving first class seats to the CSIRO and the BoM in the Global Warming Gravy Train. 13 It is claimed that these wind farms can be bought for one third of their construction cost. Such a transaction could only take place if the buyer was completely confident that the MRET legislation would remain in place. 14 One of the ironies of this extraordinary scam is that whenever a global warming story gets a run on TV, the images shown as a backdrop to the newsreader is that of cooling towers, with their characteristic catenary shape, and big white fluffy clouds of tiny water droplets above them. One reason for this confusion is that the gases emerging from the stacks of modern power stations, or even old power stations such as Hazelwood in the Latrobe Valley which have been retrofitted with the latest ash collecting equipment, are barely visible. 15 There is a parallel here with the millenarian fever of the late 9th and early 10th centuries. Europe was swept by prophecies of the end of the world and the second coming of Christ which caused great social and economic upheaval. 18 Other proposals for “renewable energy” are hot rocks or geo-thermal power, wave power, and tidal power. Although government grants have been made to companies trying to produce an economic geo-thermal power source, all have failed to do so. France built a huge tidal power scheme on the Rance Estuary but it turned out a complete failure. Portugal built a wave power project at Pelamis but it was abandoned. 19 Keith Orchison, director of consultancy Coolibah Pty Ltd and editor of Powering Australia yearbook, was chief executive of two national energy associations from 1980 to 2003. He was made a Member of the Order of Australia for services to the energy industry in 2004. 22 Hazelwood Power Station was built in the 1960s with a projected life of 40 years. It has now been running for nearly fifty years and because regular maintenance has been carried out and some retrofitting of particulate extraction systems from the flue gases has been done, the power station is extremely profitable and can expect to operate for another 20 years. 23 A 17th Century English proverb posed it thus: "Does ever any man cry stinking fish to be sold?" 26 Although domestic consumers had been paying for their consumption of electrical energy (kwhrs) alone, most commercial and industrial consumers pay not only for the energy they use but also for the maximum demand which they impose on the supply system. So a simple demand meter, which registers the highest demand a consumer has made on the system, supplies a reading of maximum demand which then has to be paid for.